You have read that sleep is distinguished by low levels of physical activity and reduced sensory awareness. As discussed by Siegel (2008), a definition of sleep must also include mention of the interplay of the circadian and homeostatic mechanisms that regulate sleep. Homeostatic regulation of sleep is evidenced by sleep rebound following sleep deprivation. Sleep rebound refers to the fact that a sleep-deprived individual will tend to take a shorter time to fall asleep during subsequent opportunities for sleep. 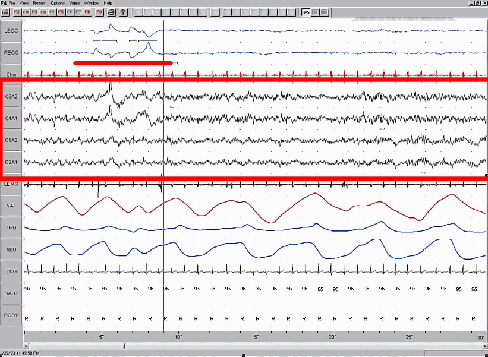 Sleep is characterized by certain patterns of activity of the brain that can be visualized using electroencephalography (EEG), and different phases of sleep can be differentiated using EEG as well. Sleep is also associated with the secretion and regulation of a number of hormones from several endocrine glands including: melatonin, follicle stimulating hormone (FSH), luteinizing hormone (LH), and growth hormone (National Institutes of Health, n.d.). You have read that the pineal gland releases melatonin during sleep. Melatonin is thought to be involved in the regulation of various biological rhythms and the immune system (Hardeland et al., 2006). During sleep, the pituitary gland secretes both FSH and LH which are important in regulating the reproductive system (Christensen et al., 2012; Sofikitis et al., 2008). 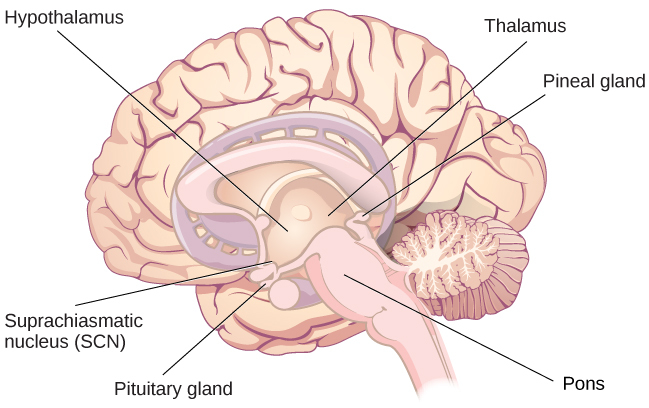 The pituitary gland also secretes growth hormone, during sleep, which plays a role in physical growth and maturation as well as other metabolic processes (Bartke, Sun, & Longo, 2013). Sleep and Why We Sleep by Rajiv Jhangiani, Ph.D. is licensed under a Creative Commons Attribution 4.0 International License, except where otherwise noted.